Trucking Moves America Forward (TMAF), the industry-wide education and image movement, today announced their plans for National Truck Driver Appreciation Week, September 9-15, 2018. 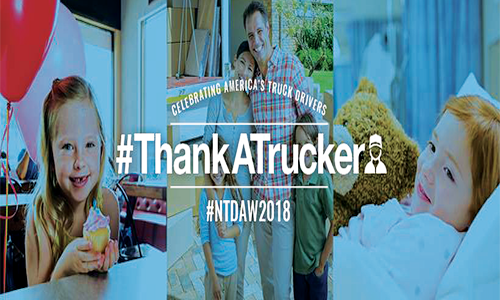 During National Truck Driver Appreciation Week, TMAF will launch an advertising and digital campaign to thank the professional truck drivers on our road, as well as educate the public about the important contributions that truck drivers make and encourage them to #ThankATrucker. The billboards will appear on highways in Baltimore, Md. ; Las Vegas, Nev.; Reno, Nev.; Indianapolis, Ind. ; Des Moines, Iowa; Conway, Ark. ; Little Rock, Ark. ; Charlotte, N.C.; Dallas, Texas; Nashville, Tenn.; Dayton, Ohio and Buffalo, N.Y. One of the billboards, which appears in Nevada, is shown below.